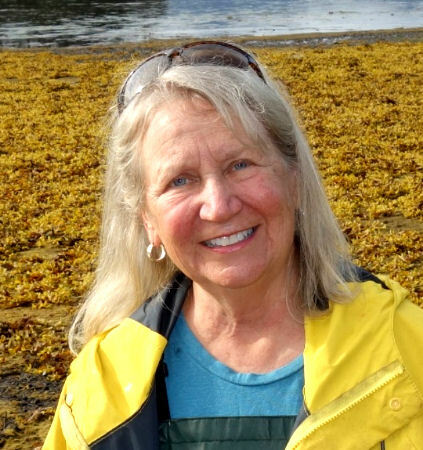 Exploring the tide-washed shores of the wilderness island where her family regularly camps, Kathleen Dean Moore writes about the web of connections that link humans to the rest of the natural world. 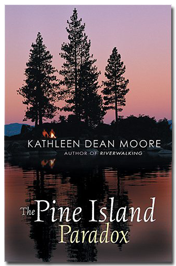 A gifted storyteller with a sly sense of humor, Moore engages the reader with tales about her family and natural encounters on wilderness excursions or within the fences of her backyard. She writes about thousands of shrimp visible at the ebb tide, fungi her botanist father cultivated in the family refrigerator, her daughter’s night in jail, bad weather, grouse dancing on their lek, and the haunting note—the augmented fourth—heard in the call of a loon, the howl of a wolf, and sacred music. In essays full of rich surface detail, she weaves arguments about the hidden connections that bind the world. She speaks for an environmental ethic of care that extends from our families to the special places we experience with them, a borderless zone of affection that embraces the human and natural world. In early morning fog, all I can see is a skim of silver on the water – no trees, no island, no boats. I climb down wet rocks to the edge of the bay and haul on the rope. Pulleys squeak and boats thump on rocks. In time, the bow of a rowboat noses through the fog, glistening with dew. I pull it to shore, unhook the line, lower myself into the inevitable puddle on the seat, and row softly into the fog. The people I love will be lying in warm sleeping bags, listening. They will hear my oars lapping the water and a raven, muttering to himself. I love this. I've come out to watch fog rise over the islands and to think about what it means to love a place. In northwest inlets, my son studies ecology. He wants to know how islands change the sea and how sea-life shapes the wooded shore – trees fallen into the bay to shelter broken-back shrimp, the living nutrients in a dead salmon carried by a bear to the base of a tree – all the beautiful, complicated connections that make life flourish over time. This is what I want to understand too: the beautiful, complicated ways that love for people and love for places nourish each other and sustain us all. The ecology, one might say, of caring. I'm trying to be quiet so I don't startle the loons, but I brought the wrong boat – the rowboat with its loose and clanky oars. I ship the oars and let the tide tangle me in a pile of kelp. My boots are jammed between the gas can and the anchor, my notebook is open on my lap, and little pains are fluttering like moths up and down the muscles of my back. The island is a place of lifting and pulling, hosting anchors and crab pots and buckets of stream water. I open my notebook. Let's put the gathered evidence in front of us and let it speak. Love has as its object: daughter, son, young woman who loves son, sudden quiet, a certain combination of smells (hemlock, salt water), mist swimming with light, purple kayak, fog-bound island, hidden cove, and the man who can drive a boat through any squall. The list is, of course, incomplete. Add silver salmon. Add unexpected sun. I know there's something important missing from my list, but I'm struggling to put it into words. Loving isn't just a state of being, it's a way of acting in the world. Love isn't a sort of bliss, it's a kind of work. To love a person is to act lovingly toward him, to make his needs my own. To love a place is to care for it, to keep it healthy, to attend to its needs. Obligation grows from love. It is the natural shape of caring. Number ten, I write in my notebook: To love a person or a place is to take responsibility for its well-being. I turn the rowboat toward camp, tugging on the clanking oars, scattering reflections, picturing my family gathering one by one to explore the bay as the tide falls. They will be stumbling over rocks and calling out to one another. "Look, here, under the kelp." Shovels over our shoulders and buckets in our hands, we hiked through beachgrass hummocks, heading for the sea. The day was cold and overcast, with a south wind so strong it bent the grass to the ground and raised ripples on the puddles in the trail. But this was good--the weather seemed to be keeping everyone else at home, probably finishing off the brandy and pumpkin pie, putting another log on the fire, wishing maybe they hadn't eaten so much. Out there in the dunes, it was only us, bending into the wind, hurrying to get to the beach an hour before the razor-clam tide, a minus tide, the lowest tide in November. This was a family trip, as Thanksgiving celebrations should be--Jon and Frank and I, and my sister and her husband, and their daughter, Carley--six of us thumping along in tall boots through the clean, wild wind. We followed the trail to the top of the foredune and stared down at the beach. There must have been a thousand people--pickup trucks parked every which way on the sand, dogs running around, people formed up into a crowd wavering along the edge of the sea, the whole flock of them running inland as each wave slid in, then scuttering seaward behind the receding line of foam. We stood for a moment, trying to figure out where all these people came from. How did they get their cars onto the beach, and why weren't they home watching football? Then we took great leaping steps down the dune and joined the crowd. There was a man in an oxford-cloth shirt, looking like he had just yanked off his tie, thrown it into the backseat, pulled on camouflage waders and walked into the sea. There was a bearded man in a slicker and shorts, with his leg-hair plastered to his skin. A woman shuffled around in neoprene waders so big that the crotch fell to her knees and the feet flopped behind her like broken legs. Two little boys ran by in high boots, chased by the surge, then back they ran, kicking at the line of foam as the water sank into the sea. Suddenly low sun broke through the clouds. Thin lines of light shot between the leaping waves, and the people burst into color--red and yellow and blue and more yellow, all reflected in the wet mirror of the beach. Each time the slick of water rose and receded, people followed it seaward. They walked a few steps, thumped the sand with the handles of their shovels, walked a little farther, thumped again, hoping to see a dimple in the sand. That would mark the place where a clam flinched and pulled back its siphons, leaving a hollow hole. Merging into the line of people, we wandered up and down the beach, thumping and watching. A shout went up and we turned sideways to brace against an oversize, onrushing wave. The wave lifted a roostertail against our calves, then rushed on with a force like a river. And then the sun was at the horizon, huge, lemon yellow, only partially visible behind suddenly golden-rimmed clouds. Everyone looked up from their digging, and this is when the next wave caught the children and filled their boots and knocked them laughing on their yellow-slickered bottoms. Forgetting their shovels and their search, everyone turned toward the sunset and watched the foam lift off the surf--the white waves, the gold-tipped clouds, the impossible sun sinking so fast we could see it go. And then it was gone and the world turned silver, even the children, shining like fish in the mist. As the dusk got darker and colder, some people gathered up their families and left the beach, their headlights making a wide sweep across the sand. There would be clams for a late Thanksgiving dinner in their houses, butter sizzling and salty sea-smelling steam fogging the windows. Other people lit kerosene lanterns and stayed on. Up and down the beach, we could see circles of yellow light swinging, and answering balls of light reflected on the slick of the ebbing tide. The darker the seas got, the more deeply blue the sky, and the first stars started to appear. Black-silhouetted people gathered around their lanterns, slowly moving together across the strand, watching the sand for a sign, their faces glowing and the fronts of the rubber overalls slick and glistening in lantern light--red, yellow, blue. They stood up to their shins in the black sea, lanterns swinging over the shallows, a wash of bright color swirling around their knees. When the seas poured out again, I saw the sand slump into a little dent. I pushed in my shovel. Then I got down on my knees, jammed my sleeve up to my elbow, and plunged my hand into cold sand. Carefully, to keep from cutting my fingers, I closed my hand around a clam and brought it up with a shout. I think I know what it means to be blessed. The empty sand, the sudden sign, and then the fat sweet clam--unseen, undeserved, enough. And I'm starting to see what it means to be grateful. When I've questioned Western philosophy about gratitude, I got a thin, dry answer: To be grateful is to feel kindly toward a benefactor, something one ought to do, but an imperfect duty, because no one can demand it from another. Like forgiveness or love, gratitude has to come freely or it loses its worth. Fair enough, but how can anyone help but be grateful on a night like the night of the razor-clam tide? To be alive to the damp wind and the laughter of children, to feel the pressure of the sea against your boots and the weight of clams in your bucket--this is enough, a great gift. And is this night so different from any other night? I'm beginning to understand that gratitude is a way of life. Gratitude is a kind of seeing, an awareness of the magnitude of the gift of this earth. To see the world gratefully is to be endlessly surprised by the bare fact of it, its beauty and power and everlastingness. Gratitude is attentiveness. It's easy to move through the world and never notice how a shifting wind changes the air from salt to cedar, easy to overlook the invisible moon that moves the tides. To be grateful is to stand with stinging eyes and reddening nose in the northwest wind, taking it in--really this, taking it in--the expanse of dunes and dusk and each blade of beach-grass drawing a circle on the sand. Gratitude is also a kind of terror. The gifts of this world come unbidden and undeserved. Humankind has no claim against the universe for starlight or clams. No one owes us any of this--the air to breathe, the children to fear for, the tides to mark each day, the winter storms. Rain is not a birthright. The world is contingent, improbable, beyond our control: it could be, or not. A small change in a constant, and none of this happens—not the universe, not the clams. If it were to be taken away, there is nothing we could do to get it back, no entitlement we could claim. The gift is a mystery, beyond understanding--why there is something, rather than nothing, and why it is so beautiful? Gratitude is a kind of rejoicing. Even though it might not have been, and may yet not be, the earth is. The sudden awareness of the gift can fill a person with joy, a well-being that arrives like high tide, lifting our spirits, expanding our sense of possibility, spreading out calm and shining at the horizons of our lives. And is gratitude a moral obligation? I would say it is. The obligation is owed to the earth itself. To be grateful is to live a life that honors the gift. To care for it, keep it safe, protect it from damage. Not to discount or ignore it, but to use it respectfully. To celebrate it, to honor the worth of it in a thousand ways, not just in words, but in how we live our lives. For people who would like to delve more deeply into the philosophical questions at the heart of the essays, here are some questions and resources that might, like the ebbing tide, expose what has been hidden beneath the bright surfaces. How has Western philosophy divided humans from the rest of the natural world and from their own bodies? Carolyn Merchant, "Science and Worldviews," Radical Ecology. New York: Routledge, 1992. Pages: Chapter Two inclusive. What is the nature of our kinship with the more-than-human world? Aldo Leopold, "Thinking Like a Mountain," A Sand County Almanac. Oxford: Oxford University Press, 1981. Pages 129-133. What have been the ecological consequences of the Christian and Enlightenment view that humans are separate from and superior to the rest of the natural world? Lynn White, Jr., "The Historical Roots of our Ecological Crisis," Science. Vol. 155, No. 3767, March 10, 1967. Pages 1203-1207. This exhilaration we feel when we are out in the weather: is it love or something else? What obligations does love impose? What's the difference between loving a person and loving a place? John Muir, "Wind-Storm in the Forests," The Mountains of California. New York: Century 1894. Do people in fact have an affinity toward other living things? What follows from that attraction about how we ought to live? E. O. Wilson, "Prologue" and "The Conservation Ethic," Biophilia. Cambridge: Harvard University Press, 1986. Pages 119-140. What is a sense of wonder? What is the moral significance of wonder? How has Western philosophy deadened our sense of wonder and mystery, and by that means, our senses of joy and gratitude? Rene Descartes, "Discourse on Method," The Philosophical Works of Descartes, Volume One. Cambridge: Cambridge University Press, 1967. Pages 115-118. How might we understand our responsibilities for the thriving of the wet, wild places and all the other ecological systems that sustain us and fill us with joy and comfort? Aldo Leopold, "The Land Ethic," A Sand County Almanac. Oxford: Oxford University Press, 1981. Pages: 237 – 264. Nel Noddings, "Construction of the Ideal," Caring: A Feminine Appraoch to Ethics and Moral Education, Berkeley: The University of California Press, 1984. Pages 104-108. Do we have responsibilities only to ourselves? To other human beings? To the land? Did Robinson Crusoe owe any regard to his island? Mary Midgley, "Duties Concerning Islands," Environmental Ethics. Eds. David Schmidtz and Elizabeth Willott. New York: Oxford University Press, 2002. Pages 71-81. How can we understand the power of the natural world, its beauty and grace, to heal and restore our spirits? bell hooks, "Earthbound on Solid Ground," The Colors of Nature, Eds. Alison Deming and Lauret Savoy. Minneapolis: Milkweed Editions, 2002. Pages 67 – 71. What does it mean to care? Caring for an aging parent, caring for a damaged earth: are these the same or different? Linda Hogan, "The Kill Hole" and "What Holds the Water, What Holds the Light," Dwellings. New York: WW Norton and Co., 1995. Pages 42 – 46 and 109 – 116. If it's true that "in wildness is the preservation of the world," how can we hold on to what is important about a wilderness experience, even as we return to our homes? Henry David Thoreau, "Walking," The Major Essays of Henry David Thoreau, Ed. Richard Dilman. Albany, New York: Whitson Publishing Co, 2001. Pages 45 – 50, 54 – 57. Is an act right if it creates the greatest good for the greatest number? John Stuart Mill, "What Utilitarianism Is," On Utilitarianism, Ed. Samuel Gorovitz. Indianapolis: Bobbs-Merrill Co, 1971. Pages 17 – 30. Do we have responsibilities toward future generations? What could they be? How could that b e possible? Ernst Partridge, "Future Generations," A Companion to Environmental Philosophy, Ed. Dale Jamieson. Oxford, U.K.: Blackwell Publishers, 2001). How can we learn to live in thriving biocultural communities, caring for our homeplaces as well as for the distant, wild country? Frank K. Lake, "In the Sacred High Country," Intricate Homeland: Collected Writings from the Klamath Siskiyou, Ed. Susan Cross. Portland, OR: Headwaters Press, 2002. Pages 84 – 94. ??? Where Should I Live, and What Should I Live For? If you love wild places, where should you live? What does it mean to live responsibly on the land? Henry David Thoreau, "Where I Lived and What I Lived For," Walden. Princeton, NJ: Princeton University Press, 1971. Pages 81 – 98. What are the sources of distrust? How might we be trustworthy and live in peace? Thomas Hobbes, "Chapter 13: Of the Natural Condition of Mankind, As Concerning their Felicity and Misery," Leviathan, Ed. Edwin Curley. New York: Hackett Publishing Company, 1994. Pages 74 -78. What does it mean to restore a river or a forest? How might ecological restoration help us find what it means to be fully human? W. S. Merwin, "Unchopping a Tree," The Miners' Pale Children. New York: Henry Holt, 1994. What is death? What is life? Does one strip the meaning from the other? Kathleen Dean Moore, "The Testimony of the Marsh," Holdfast. New York: The Lyons Press, 2000. Pages 19 – 23. Is death our most significant encounter with the natural world? Joyce Carol Oates, "Against Nature," Woman Writers: Occasions and Opportunities. Ontario Review, 1988. Is the world sacred? If it is, what could that mean? If it is, what does that call us to do, and who does that call us to be? T. C. McLuhan, "Encounters with the Sacred," The Way of the Earth, New York: Simon and Schuster, 1994. Pages 406 – 433. A multiple choice question: (a) Nothing is a miracle. (b) Everything is a miracle. (c) Both of the above. Paula Gunn Allen, "Growing Up Sacred," Paula Gunn Allen: Berkeley, 2000. By what language, what song, what science, do we express joy and gratitude for the marvelous, mysterious world? Chet Raymo, "Matins: Put on Your Jumping Shoes," Honey From Stone: A Naturalist's Search for God. New York: Hungry Mind Press, 1987. Pages 3 – 23. What are the most important gifts we give our children? Rachel Carson, The Sense of Wonder. New York: HarperCollins, 1998. Selected pages 15 – 106. Is the most important role of wilderness to remind us of what we have lost? Michael P. Nelson, "An Amalgamation of Wilderness Preservation Arguments," The Great New Wilderness Debate, Ed. Baird CAllicott and Michael Nelson. Atlanta, GA: The University of Georgia Press, 1998. Pages 154 – 197. What do we lose, when we lose a species? What do we lose, when that species is a symbol of life itself? Nancy Lord, "Looking Salmon in the Face," Place in the Wild, Ed. David Clarke Burks. Washington, DC: Island Press, 1994. Pages 67 – 74. If we can imagine that the world was created by seven days of separations, the seas from the dry land, can we imagine how it might all come back together again? Genesis 1 – 9, The Bible. What is gratitude? Is it a moral obligation? How can it be expressed? What can women tell us about the degradation of the earth? 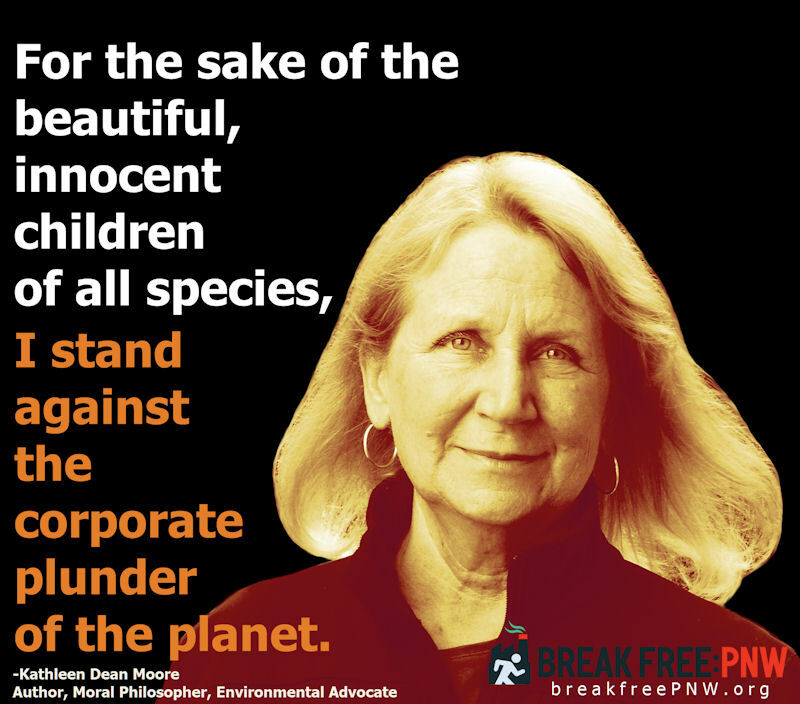 Karen Warren, "The Power and Promise of Ecological Feminism," Environmental Ethics, vol. 12, 1900. Is there reason to be hopeful that we can find a way to live on earth with respect, gratitude, and caring? Scott Russell Sanders, "A Conservationist's Manifesto," Coming to Land in a Troubled World, Ed. Peter Forbes. San Francisco: The Trust for Public Land, 2002. Pages 15 – 26.